Theraflow dual foot massager is a special pressure device used to alleviate both common and serious foot problems. These issues include aches, heel pain, muscle tension, spurs, gout and plantar fasciitis, among many other problems. The device has a set of rollers that massage the feet, subsequently offering relief from pain and soreness. It might sound speculative, but taking care of your feet is crucial to maintaining your overall health and wellbeing. Several studies show that the foot has a reflex connection to various vital organs such as the lungs, kidneys, spleen and heart. This means that the health of your feet has a direct connection with these organs. For this reason, it is imperative that you go the extra mile to make sure your feet are in good health. With this in mind, investing in the Theraflow dual foot massager roller seems to be a logical decision. What is more amazing is that you may use it either at home or in the office with relative ease, without disrupting your schedule. How does the Theraflow dual foot massager roller work? Using the Theraflow dual foot massager does not require a degree in rocket science. The device is simple and very easy to use. Furthermore, it’s made from high quality Theaceae wood, which is ideal for feet of all shapes and sizes. The Thereflow two-footed roller massager offers two different massaging modes for you to choose from. Acupressure mode or Kneading mode. 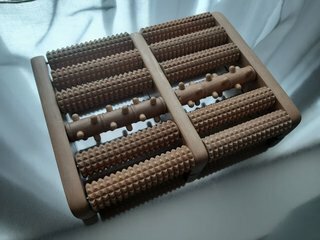 The Acupressure mode requires you to position your feet across all the five rows of the rollers, applying pressure and releasing every few seconds. The nubs and ridges on the rollers will essentially stimulate your feet, subsequently providing the perfect form of relief and relaxation. For best results, you should utilize the acupressure mode at least twice a day to relieve pain and soreness. 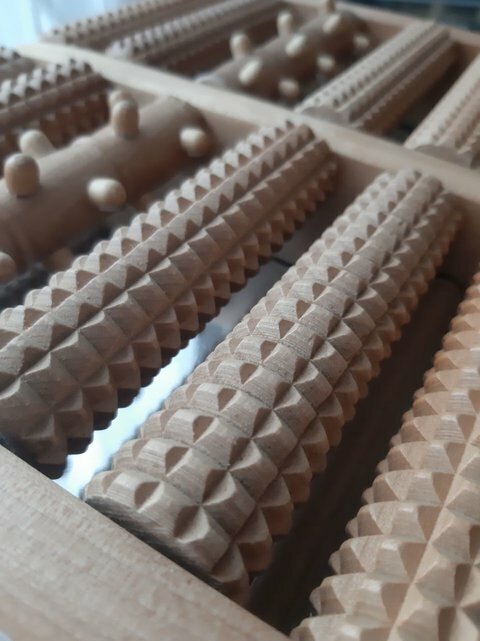 The Kneading mode requires you to consistently roll your feet back and forth over the nubs and ridges of the rollers without necessarily applying too much pressure or pressing down hard. You should perform this mode of treatment for a few minutes at a time for optimum results. The kneading mode helps deal with heel spurs, aches and conditions such as plantar fasciitis. Theraflow has 10 independent rollers (5 on each side) designed to give your feet maximum relief and comfort against most form of foot ailments. The rollers have ridges and prominent nubs that help stimulate the feet and improve blood circulation. The massager is designed to accommodate both of your feet at the same time. Furthermore, it has standard dimensions suitable for feet of all sizes. The Theraflow dual foot massager offers two different treatment modes, including the acupressure mode and kneading mode, for optimum pain relief and maximum relaxation. Importantly, the massager comes with a comprehensive user manual that contains all the instructions on how to make the most out of the two modes of treatment. Previously, patients with foot problems had to visit a podiatrist or chiropodist every few weeks to treat the nagging pain on their feet. Treating the problem at home was simply impossible due to unavailability of relevant devices. Nevertheless, with the emergence of foot massagers such as the Theraflow Dual Foot Massager, you can now handle your foot problems from the comfort of your home or office. The best part is that these devices are highly efficient and they do not cost much. Furthermore, you can use them at anytime without interrupting your schedule. Get one today and say goodbye to all your niggling foot problems. PreviousWho is a Podologist? What does a foot doctor do?